LA Mixture of Romaine and Iceberg Lettuce, Red and Green Bell Peppers, Tomatoes, Green Onions, Flour Tortilla Puffs,Teriyaki Glazed Chicken Breast, and Light Oriental Dressing. A Mixture of Romaine and Iceberg Lettuce, Red and Green Bell Peppers, Tomatoes, Green Onions, Crisp Tortilla Strips, Jicama, Achiote Seasoned Chicken Breast, and Topped Off with has a Lime Cilantro Vinaigrette. A Mixture of Romaine and Iceberg Lettuce, Red and Green Bell Peppers, Tomatoes, Green Onions, Roasted Walnuts, Real Bleu Cheese Crumbles, Chicken Breast, Bacon, Champagne Dressing or Blue Cheese Dressing. Tender Hearts of Romaine, Tossed with our Classic Caesar Dressing, Parmesan Cheese, a Little Pepper, Chicken Breast and Antonio's Homemade Croutons of romaine. We Start with Tender Hearts of Romaine and then Start Layering Tomatoes, Diced Fresh Avocado, Bacon, Bleu Cheese Crumbles, Hard Boiled Egg, Char-broiled Chicken Breast, and then Top it Off with Our Champagne Vinaigrette. All burgers are 1/3 lb and you can substitute either a Turkey burger or a Garden burger at no extra cost. 1/3 lb. Fresh Ground Chuck Fully Garnished. 1/3 lb. Fresh Ground Chuck with Your Choice of American, Pepper Jack, Swiss, or Cheddar Cheese. 2/3 lb. Fresh Ground Chuck Fully Garnished. 2/3 lb. Fresh Ground Chuck Your Choice of American, Pepper Jack, Swiss or Cheddar Cheese. Nuclear Hot! Have We Made Our Point Clear? 1/3 lb. Fresh Ground Chuck with Roasted Serrano Peppers, Pepper Jack Cheese, and a Chipotle Mayo. 1/3 lb. Burger with Pepper Jack Cheese, Hot Jalapeño Peppers on an Onion Roll. 1/3 lb. 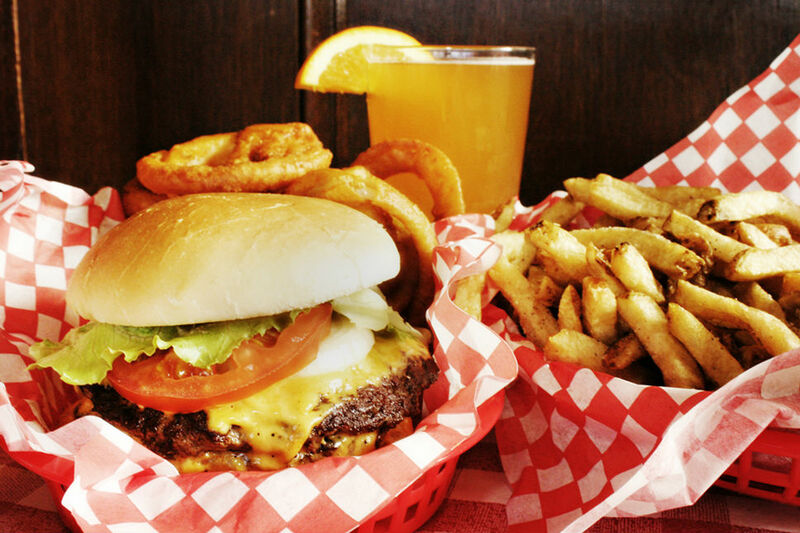 Burger with Swiss cheese, Two Strips of Thick-Sliced Bacon Served on an Onion Roll. 1/3 lb. Burger with Real Bleu Cheese Crumbles and Two Strips of Thick-Sliced Bacon (for Blue Cheese Lovers!). 1/3 lb. Burger Blackened with a Very Flavorful and Little Spicy Seasoning, with Salsa and Pepper Jack Cheese. 1/3 lb. Burger with Bacon,Grilled Onions, Barbeque Sauce and Pepper Jack Cheese. 1/3 lb. Burger Topped with Fresh Sautéed Mushrooms, Sour Cream, and Swiss Cheese on a French Roll. 1/3 lb. Burger with Our Homemade Guacamole. L1/3 lb. Burger with Our Homemade Guacamole and Two Strips of Thick-Sliced Bacon. 1/3 lb. Burger with Grilled Onions and Cheddar Cheese, Served on Toasted Sliced Sour Dough. 1/3 lb. Burger Served Open with Our Homemade Chili, Topped with Grated Pepper Jack & Cheddar Cheese and Chopped Onions on a French Roll. 1/3 lb. Burger Grilled with Teriyaki Glaze and Topped with Pineapple Rings. 1/3 lb. Burger, Grilled Onions, American Cheese, Lettuce, Tomato, Pickles and Our 1000 Island Dressing. Triple Patty and 3 Slices of Cheese. That's a ONE POUNDER! For Those That Gotta Have It! All burgers are 1/3 lb and you can substitute either a Turkey burger or a Garden burger. 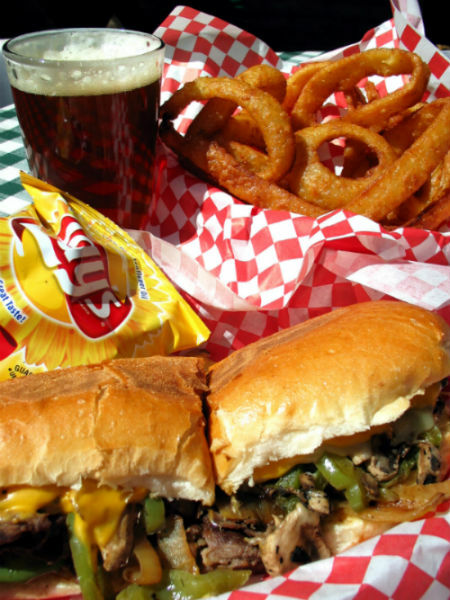 You Can Substitute Our Breast Meat on Any Cheesesteak! Thin-Sliced Steak with Grilled Onions, Topped with Swiss and American Cheeses. We Start with Rib-Eye Steak Shaved Thin and Topped with Grilled Onions, Roasted Serrano Peppers, and Melted Pepper Jack Cheese. Cheesesteak with Sauteed Fresh Mushrooms. Cheesesteak with Sautéed Fresh Bell Peppers. Cheesesteak with Sauteed Fresh Mushrooms and Bell Peppers. Cheesesteak Seasoned with Cajun Spices. Cheesesteak with Hot Jalapeno Peppers. Thin-Sliced Pastrami Grilled with Onions, Topped with Melted Swiss and American Cheese. Thin-Sliced Steak, Caramelized Onions, and Topped with Creamy Brie. Thin-Sliced Steak, Grilled Onions, and Choice of Provolone or Cheese Whiz like They Do Back There. Chicken Breast Char-Broiled and Topped with Cheddar Cheese. Sandwiches are Garnished with Lettuce, Tomatoes and Mayo. Char-broiled Chicken Breast with Swiss Cheese and Two Strips of Thick-Sliced Bacon. Sandwiches are Garnished with Lettuce, Tomatoes and Mayo. 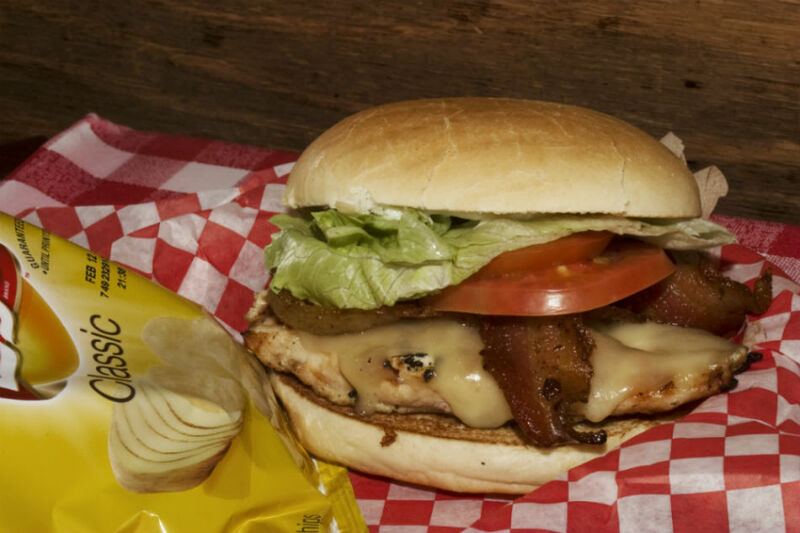 Char-Broiled Chicken Breast with Bacon, Grilled Onions, Barbecue Sauce and Pepper Jack Cheese. Sandwiches are Garnished with Lettuce, Tomatoes and Mayo. Char-Broiled Chicken Breast Seasoned with Salsa, Our Cajun Spice and Topped with Pepper Jack Cheese. Sandwiches are Garnished with Lettuce, Tomatoes and Mayo. Char-Broiled Chicken Breast, Fresh Roasted Chili Pepper and Melted Pepper Jack Cheese. Sandwiches are Garnished with Lettuce, Tomatoes and Mayo. Char-Broiled Chicken Breast with Hot Jalapeño Peppers and Pepper Jack Cheese. Sandwiches are Garnished with Lettuce, Tomatoes and Mayo. Char-Broiled Chicken Breast Basted with Teriyaki Glaze and Topped with Pineapple Rings. Sandwiches are Garnished with Lettuce, Tomatoes and Mayo. Char-Broiled Chicken Breast with Our Homemade Guacamole. Sandwiches are Garnished with Lettuce, Tomatoes and Mayo. Char-Broiled Chicken Breast with Fresh Mushrooms Sautéed and Topped with Sour Cream and Swiss cheese. Sandwiches are Garnished with Lettuce, Tomatoes and Mayo. Nuclear Hot! Have We Made Our Point Clear? We Start with a Fresh Skinless, Boneless Chicken Breast, and Add Roasted Serrano Peppers, Pepper Jack Cheese, and a Chipotle Mayo. Sandwiches are Garnished with Lettuce, Tomatoes and Mayo. We use fresh skinless, boneless chicken breasts and garnish them with lettuce, tomatoes and mayo.